Evion Cream is a moisturizing cosmetic cream enriched with Aloe Vera and Vitamin E. Evion cream is non-oily and gets absorbed into the skin quickly. It nourishes and moisturizes the skin. Evion cream nourishes from within to make the skin look and feel healthy. The consistency of the cream is thick and it is milky white in colour. The smell of Evion cream is pleasant and decent for summer. The pleasant perfume of the cream gives a fresh feeling after the use. 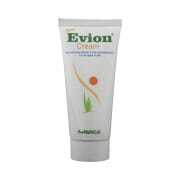 Evion Cream is really the cream for all seasons. It protects from heat and soothes the skin from within. Take the cream in your hand and massage all over the face evenly with upper strokes. A licensed pharmacy from your nearest location will deliver Evion Cream. Once the pharmacy accepts your order, the details of the pharmacy will be shared with you. Acceptance of your order is based on the validity of your prescription and the availability of this medicine.